Police stand next to an ambulance and bike involved in an accident on Sheridan Road Thursday. An 18-year-old Northwestern student was killed after an accident with a cement truck while biking. First-year Northwestern student Chuyuan “Chu” Qiu was struck and killed while biking Thursday at the intersection of Sheridan Road and Garrett Place at about 5 p.m. The collision occurred between the student and a cement truck in the 2000 block of Sheridan Road, between Garrett Place and Library Place. The 18-year-old Weinberg student was unresponsive when Evanston Fire Department paramedics arrived and was transported to Evanston Hospital with multiple injuries. She was pronounced dead at the hospital. Qiu was identified in an email sent to the Northwestern community by Dean of Students Todd Adams. Qiu was originally from Nanjing, China, the email said. During her first quarter at NU, she was a member of the Kaplan Humanities Scholars Program and lived in the Residential College of Community and Cultural Studies. Qiu was biking westbound on Northwestern Place when the collision occurred, with the truck travelling north on Sheridan Road. Evanston police Sgt. Dennis Leaks said he believed she was biking on the road. 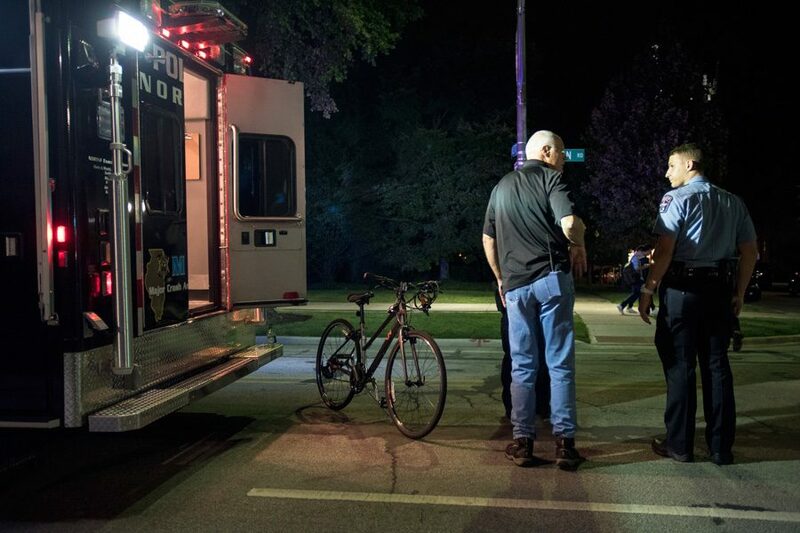 The driver of the truck, a 38-year-old Des Plaines, Illinois resident had a green light and was proceeding north on Sheridan Road when the accident occurred, said Evanston police chief Richard Eddington. The contact between Qiu and the truck happened on the last curbside wheel on the truck, Eddington said. The impact of the collision caused her to roll under the truck. The truck driver has not been issued any citations at this point. “At this point in time, this is preliminary comment, we see no traffic violations or wrongdoing by the truck driver,” Eddington said. Of the $5 million the University will donate to the city, Evanston Mayor Elizabeth Tisdahl chose to allot the largest portion of the first $1 million installment to the Sheridan Road improvement project. Half of the first $1 million was devoted to Sheridan Road development, including painting new bike lanes and resurfacing. The project was scheduled for completion in 2017. Improvements to Sheridan Road, which included bike lanes, were postponed by City Council in 2014 until 2017 due to construction elsewhere in the city. The plan from 2014 shows the construction of a two-way bike lane along parts of Sheridan Road and Chicago Avenue that run through Northwestern’s campus. This story was updated to include details from Evanston police, the identity of the student and a statement from Associated Student Government.